When not skiing in St Moritz, there is still plenty to do. The world famous Cresta run; polo, golf, cricket and horse racing on the lake and a health spa in St Moritz Bad. Eating out can be expensive, but there are many restaurants to choose from and the night life in St Mortiz is varied and vibrant. 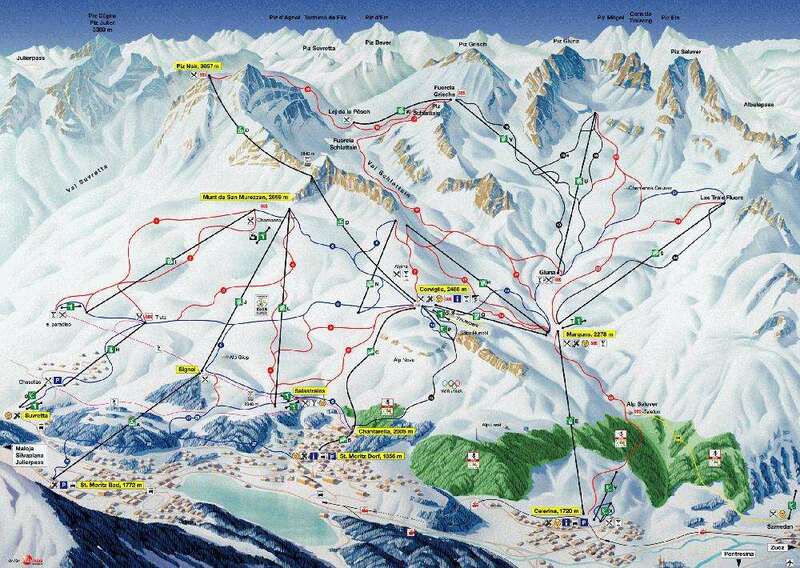 St Moritz has three separate ski areas taking in 350km of runs, although the third area is 20km away. Intermediates will enjoy exploring the Corviglia area directly above the town, where there is a great selection of red runs, while Experts have a vast selection of off-piste terrain as well as the more challenging runs at Diavolezza and Lagalb. 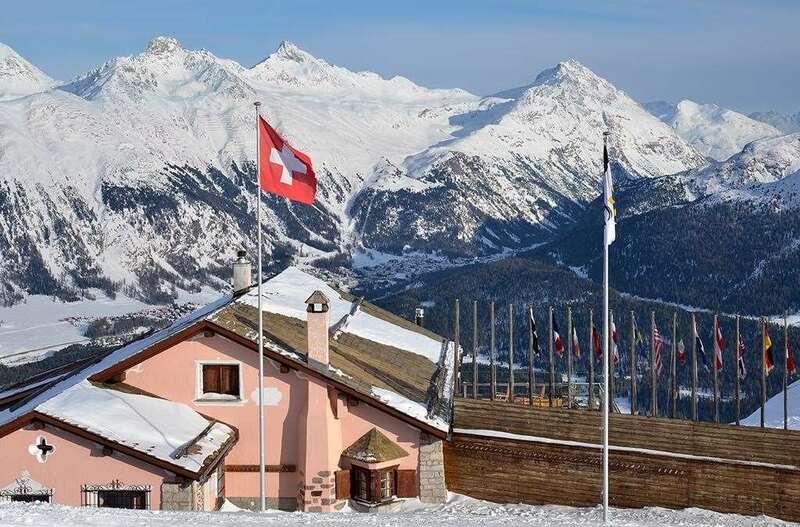 The Upper Engadine boasts 350km of piste and St Moritz skiing holidays offer 5 main areas; Corviglia, Corvatsch, Furtschellas, Diavolezza and Lagalb. Like Engelberg, Crans Montana and Villars, the lift system is extensive and queues are not considered troublesome. Set at high altitude with well groomed pistes the climate is dry and crisp and the natural snowfall is reliable. There are also 170 snow cannons spread out over 80% of the St.Moritz pistes which supplement for the natural snowfall by blasting out artificial snow which help contribute to skiing throughout the season. Cross-country skiers are well catered for with 180km of trails throughout the valleys, and there are 150km of walking trails. The Muottas Muragl mountain is entirely given over to hiking and tobogganing in the winter. Innsbruck International aiport is the nearest airport to St. Mortiz which is accessible via car or bus transfer around 183 km away. Excellent customer service from Iglu Ski. This was our first time in St Moritz and will definitely return. The transfers from Zurich by train took us on the UNESCO line which was spectacular. The Hotel Monopol was well placed for skiing, bars and shops. Wonderful staff and excellent restaurant. Make sure you take a horse carriage ride up Val Roseg and a cocktail in the Hotel Kulm. We felt the service offered by Igluski was excellent. St. Moritz is a chic and vibrant town. It has a high quality ski area with extensive skiing. Corviglia is best for beginners with some good easy runs, but it is the intermediate skiiers who will be able to take full advantage of the ski area, Corviglia and Corvatsch. They offer plenty of red runs and there are plenty of black runs on Diavolezza and Lagalb. For non skiiers there is a wide array of activites including cross country, toboganning and winter walks. There is a frozen lake which hosts many sporting and social events, including the Cartier Polo on snow and 'White Turf' horse racing. The restaurants in St. Moritz are excellent and if you like dacing there is one of the best clubs I have ever been to in a ski resort. 'Dracular Club'! There is something for eveyone.